An initiation shot, the ringing of a Chinese bell, a personalized membership card — sounds like the makings of an induction ceremony into some kind of secret society. And that’s because, it is. Revealed this month, the “Walk Up The Wall of China” challenge at Kendall Square’s Sumiao Hunan Kitchen is a covert cocktail club positioned as an invite-only group for Boston’s prime mixed drink enthusiasts. The mysterious menu is the brainchild of Bar Manager, Vinicius Stein, whose inspiration for the hush-hush lineup came from his interactions with Sumiao regulars. “They tell me what alcohol they want to drink, and I make them something new every time.” said Stein. “Having the trust of total strangers to craft them what I would like to drink was inspirational.” He started writing down the recipes and soon had a repertoire of 25 off-the-menu beverages featuring a variety of traditional liquors like vodka, gin, tequila, rum and whiskey (including homemade reductions/shrubs and house-infused bitters), as well as some Asian spirits like soju, baijiu and yuzu liqueur. Stein, whose main goal was to increase awareness about the goings-on outside American bar culture while also staying true to Hunan culture, teases a couple of the cocktails that make the cut. Standout sips include The Beijing Pear Fizz (his take on an egg white cocktail), Sour Negroni (the classic apéritif with an Asian twist), and Dragon’s Breath (a extremely spicy concoction made with gin). Obscure messaging aside, there are a few details that the Sumiao team has offered on how the special group will operate. Word is that a limited number of invitations will be given to bartenders and managers to pass along to a few lucky guests. 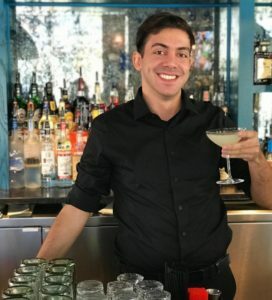 Once initiated, you’ll be able to extend an invitation to fellow cocktail enthusiasts (read: your friends) once you’ve completed a few undisclosed steps. Lips are pretty much sealed on the intricacies and program logistics beyond that, so beware — they may swear you to secrecy as well in a cross-your-heart-hope-to-die sort of way (kidding, kind of). New members are accepted on a rolling basis, so stop on by Sumiao Hunan Kitchen and keep your ears open for the ringing of the Gong — it may be your signal that the opportunity to join the guestlist is here.